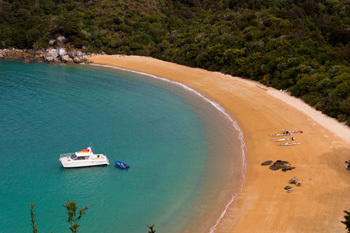 Abel Tasman National Park, the directory for accomodation and activities. 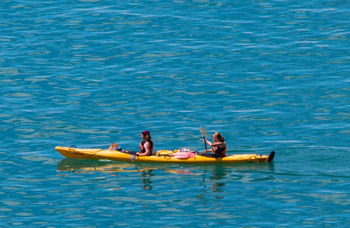 Welcome to The Abel Tasman - find accomodation and activities in New Zealand's Abel Tasman region. One of New Zealand's 14 national parks, the Abel Tasman National Park is the smallest at 22,530 hectares. The Abel Tasman is covered in native bush, interlaced with walking tracks and surrounded by clear blue/green seas and welcoming bays with golden sand. Many people enjoy walking the picturesque Abel Tasman Coastal Track, breaking the walk with a well deserved swim in one of the Abel Tasman's tantalising bays. 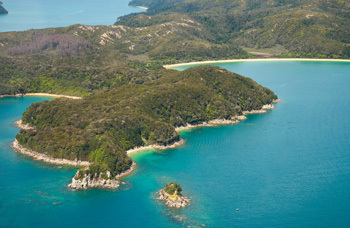 There's also one of New Zealand's marine reserves off the Abel Tasman National Park's coast. This marine reserve reserve provides a safe haven for the marine wildlife in the area and is therefore a great place to scuba dive or snorkel, just see how big the crayfish grow. The area is home to the New Zealand fur seal, which can be seen swimming in the blue waters or resting on rocks along the coastline. The Abel Tasman National Park is within easy driving distance of Nelson, Motueka, Kaiteriteri, Upper Moutere, Tasman and Mapua, areas rich in arts and crafts, cafes, vineyard and wineries. Not to mention all the activities available from sea kayaking to tramping. Kahurangi and Nelson Lakes National Parks are also nearby, both offer extensive hiking tracks and stunning scenery. So what are you waiting for? Use the links to help you find a place to stay, whether you're looking for a holiday home, bed and breakfast or a lodge, there's one listed. There's so much to do here you may find yourself booking next year's holiday in advance. New Zealand's Abel Tasman Coastal Track - Thanks to the Department of Conservation. Thanks to Harold & Yen for their Abel Tasman experiences - enjoy more of their adventures.